Perfect for Halloween, these skewers are scary delicious. The spicy, bright red sauce is served with “stake piercing” meat and potatoes to add an eerie quality to your Halloween Dinner or Party. Easy to make, the steak is tossed in spices, skewered with baby potatoes, and then seared in a sauté pan. Our Pipián Rojo sauce is made in a blender or food processor with ingredients such as garlic, roasted pepitas (pumpkin seeds), peanut butter, vinegar and dried ancho chiles. If you can’t find the Paddle style Bamboo Skewers, they can be purchased through Amazon. Preheat the oven to 350 degrees. Place the pepitas on a sheet tray and toast for 10 minutes. Remove from the oven and set aside. Add the potatoes to a small saucepan and cover with water. Bring the water to a boil and then cook for 10-12 minutes or until a paring knife inserts easily into the potatoes. Drain and let dry on a towel, then place them in a bowl and add in 1/2 teaspoons of olive oil, ¼ teaspoon salt. Mix well and set aside. Mix together in a large bowl ½ teaspoon garlic powder, 1 teaspoon salt, 1/8 teaspoon pepper, cumin, and smoked paprika. Cut the sirloin into large cubes and add to the bowl; toss in the spice mixture. Set aside for 30 minutes. 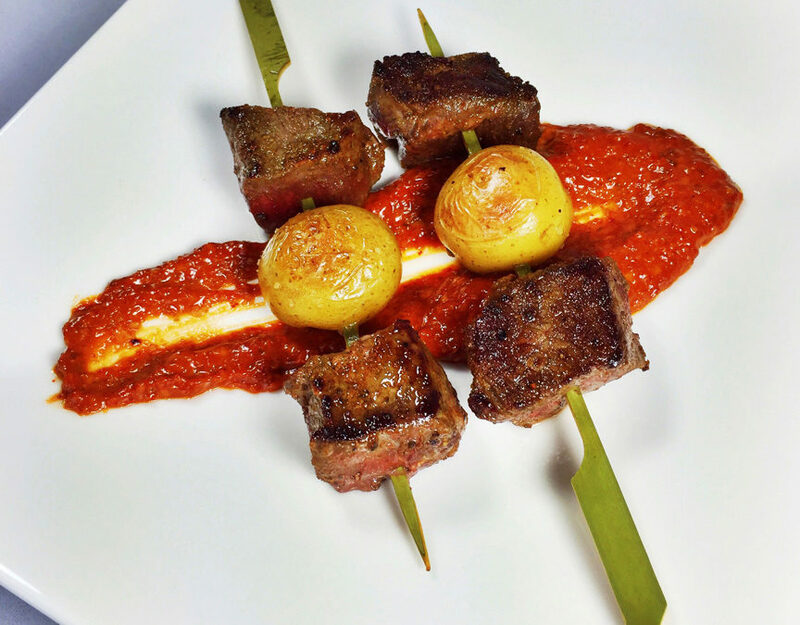 Thread 2 beef cubes on a skewer with one potato in the center. Preheat a sauté pan, over medium high heat. When hot, coat the bottom of the pan with a thin layer of olive oil. Sauté the skewers over high heat for about 3 minutes, turning and sauté 3 minutes more or until the steak is medium. Serve with the Pipián Rojo sauce under the skewers or on the side.